Today in Masonic History George Gordon, 5th Duke of Gordon is born in 1770. George Gordon, 5th Duke of Gordon was a Scottish nobleman, politician and soldier. Gordon was born in Edinburgh, Scotland on February 2nd, 1770. He was educated at Eton College. After Eton he joined the military and rose through the ranks to become a general. 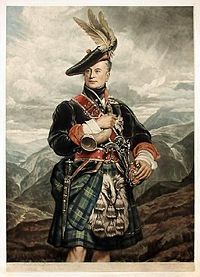 He raised the 92nd Highlanders and commanded them in Spain, Corsica, Ireland and the Netherlands. It was in the Netherlands that he commanded a division during the Walcheren Expedition in 1809. The Walcheren Expedition was a failed British mission during the Austrian Empire's war with France. It was meant to open a new front for the war in Netherlands. In 1806 Gordon became a member of Parliament in the House of Commons. He served Eye, Suffolk, England until 1807. In 1807 he was called to the House of Lords in a minor peerage held by his father. In his career in Parliament one of the most notable events was his opposition to the Great Reform Bill of 1832. The bill would have given representation to underrepresented urban areas in England, Scotland and Ireland. Gordon was one of 22 "stalwarts" who voted against the bill being read in the House of Lords. This was after several members of the House of Lords had abstained from the vote. Among some of the other political positions that Gordon held included, Keeper of the Great Seal of Scotland. A politician that his father held. He was appointed to the Privy Counselor in 1830. He was Governor of Edinburgh Castle. He was Lord Lieutenant of Aberdeenshire. He was chancellor of Marischal College in Aberdeen. He was Lord High Constable of Scotland. Part of his time as Lord High Constable fell during the Coronation of King George IV. Gordon passed away on May 28th, 1836. Gordon was the Grand Master of the Grand Lodge of Scotland from 1792 to 1794.